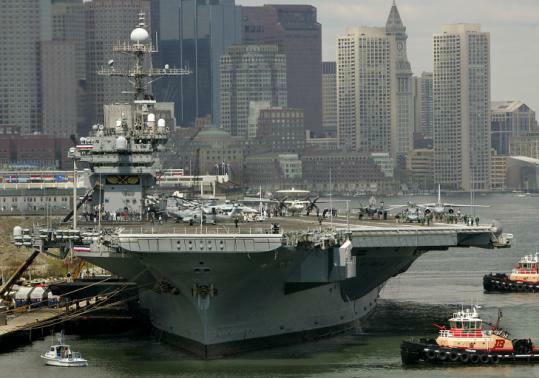 AUGUSTA, Maine - A plan to bring the decommissioned aircraft carrier USS John F. Kennedy to Portland Harbor as a tourist attraction and museum got support from the Maine House yesterday. Representatives passed a nonbinding resolution backing the idea, which supporters say will generate tourism and jobs and will not cost taxpayers anything. The resolution awaits a Senate vote. Most of the state’s gubernatorial candidates and the Portland City Council also back the plan. The resolution’s sponsor, Representative Patsy Crockett, said the nonprofit USS John F. Kennedy Museum has cleared an important hurdle in bringing the 1,052-foot aircraft carrier to Portland by advancing in the application process. Of the three groups that submitted applications to the Navy to get the ship, the Maine group is one of two that advanced to the second phase. The Navy is not disclosing the other competitor. The USS John F. Kennedy Museum group has until February 2011 to submit more details of its proposal, including marketing, income sources, waterfront facilities, and environmental considerations, said Crockett, Democrat of Augusta. Either or both of the groups could advance to phase three, which calls for more plans regarding mooring the ship, towing it from its berth in Philadelphia, and more details on operating the museum, Crockett said. “The group is aware that this is going to take a lot of money, and they are going to have to have a huge fund-raising effort,’’ she said. Some of the preliminary ideas include making the ship a year-round attraction, with a convention center, restaurant, and even an ice rink on the deck in the winter, Crockett said. Some lawmakers questioned the cost of the proposal. Senator Peter Mills, Republican of Cornville, said it is unlikely that private fund-raising will cover the cost of transporting the ship to Portland, let alone maintain it. “They’re going to be lucky if they can find an endowment to keep it going,’’ said Mills, who is also one of several candidates for the 2010 GOP gubernatorial nomination. Eighteen of 22 candidates for Maine governor surveyed by Portland Magazine have given qualified or enthusiastic support to the proposal. The Portland City Council voted 9-0 in favor of the plan. Launched in May 1967, the JFK was decommissioned in August 2007.